Traveling in Europe is so much more interesting if you understand the iconography of Christian art. You can quickly recognize the stories played out in panel painting or identify individual saints on the facade of a Cathedral. Once you get past the “who and what” fundamentals of a work of art, you can examine the execution and atheistic choices the artist made in depicting the Annunciation, the Descent from the Cross, St Peter or St Catherine. That is, I thought I knew the major iconography of the Saints. 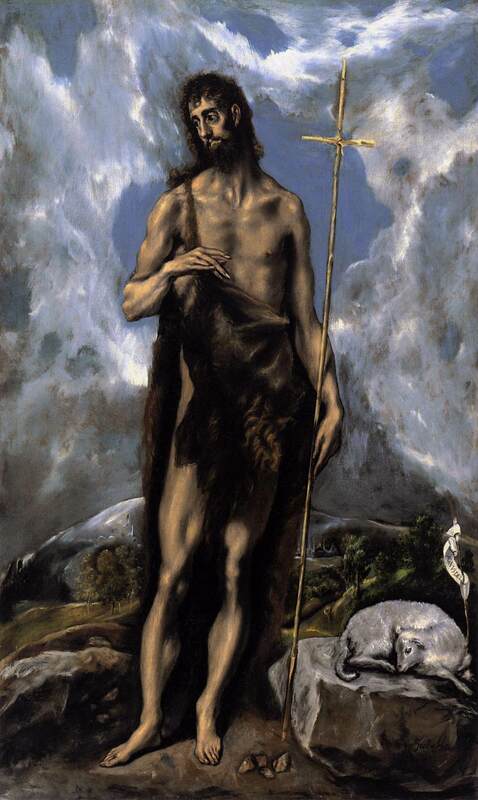 St. John the Baptist is easy to pick out of a line up: under dressed and in camel hair, many times with a staff or lamb and generally looking disheveled. 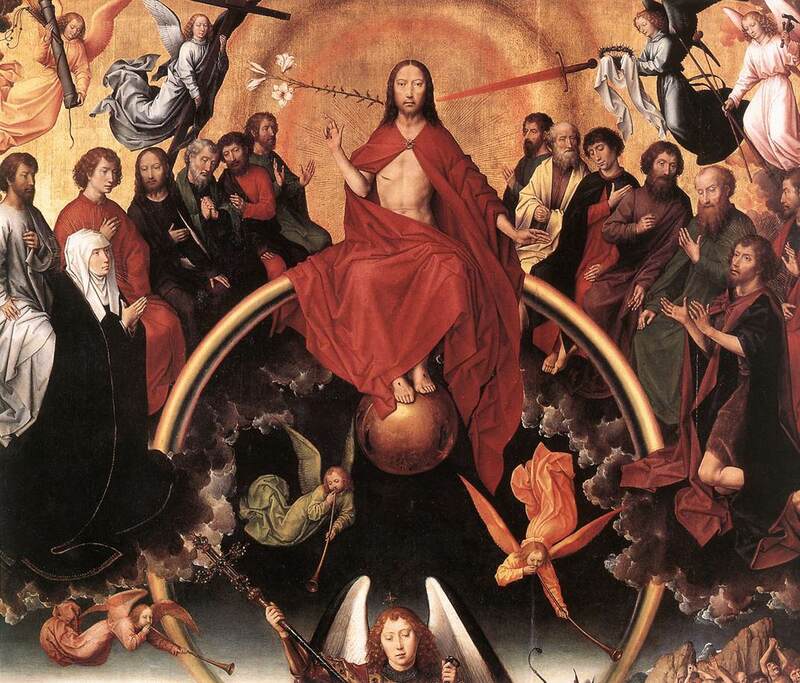 Given his importance, John is often one of the first Saints to be included in domestic devotional altarpieces and is usually placed prominently in larger groupings. 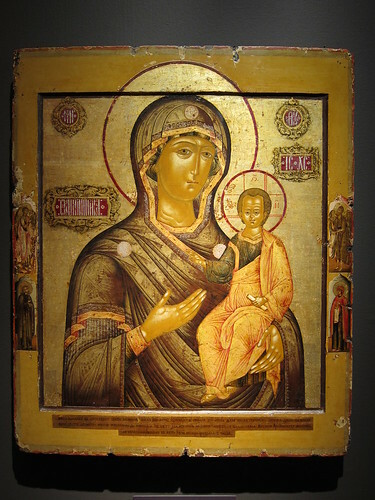 Last week, I visited the Museum of Russian Icons in Clifton, MA. (Their collection is incredible; I’ll post more on that soon.) I was enjoying the range of Mary and Child iconography (hurray Hodegetria), when I noticed something really surprising. On the left frame is a small winged angel Gabriel figure but on the right frame is St. John the Baptist with wings. With the fur robe and scruffy face, it is undeniably John the Baptist. I was really confused by this; Saints are never depicted with wings. 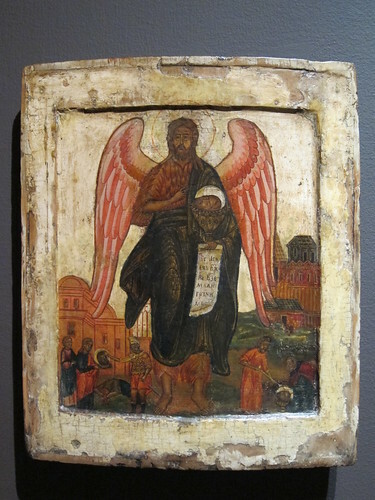 While I did see other “regular” images of St. John the Baptist throughout the museum’s icons, wings popped up again in one other piece. In the lower half of this work, there is a beheading scene (right) and the head being given to a woman (left) further providing evidence that the central figure is St. John the Baptist. I was really intrigued by John the Baptist with wings so I talked with one of the museum docents. In Russian iconography (like most Christian art), angels have wings. But besides the seraphim, there is a set of angel that act as messengers. Their wings symbolize the ability to communicate between the divine and humans. For example, the three travelers/angels who visited Abraham are popular in Russian art. One iconographic aspect of John the Baptist is his role as prophet declaring the arrival and ministry of the Christ. In this way, John acts like a divine messenger and can therefore be shown with wings. John is also the only Saint ever shown in Russian art with wings, perhaps given that he was Jesus’ cousin and played a critical role in the gospels. 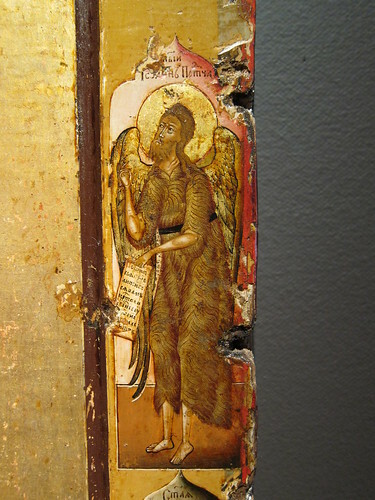 Finding these angelic wings brings an interesting nuance to the John the Baptist visual program. In the two cases I found, he is holding a scroll which is in line with the messenger role the wings suggest. It is also a nice example of differences between the Western and Eastern Christian art traditions. I wonder if the rules really are so strict for depiction with wings? Could this divine messenger aspect apply to Old Testament prophets too? That image would have to present a prophet in a heraldic way, but surely it’s possible. I guess I have something new to look for in the catalog of Eastern Orthodox art! But there you have it, St. John the Baptist with angel wings. I remember being very surprised to find a shrine to John the Baptist in the Umayyad Mosque in Damascus, and to discover that he is an important Islamic Prophet. Local legend has it that he will rise from one of the towers of the mosque when the world ends. Thanks by the way for passing by blog, I’m enjoying reading yours. Thanks for the comment. It looks like I have some more John the Baptist iconography to discover! Thanks! I’m always excited to find little nuggets like this.